This item is fairly self-explanatory: it is a tea mug that actually brews the tea inside the mug itself (within the tea infuser). The tea infusers are usually custom made to fit perfectly inside the mug to place your favorite loose leaf tea. Some mugs do state that you can use tea bags within the infusers, but I always recommend loose leaves for their health benefits, taste, and overall better quality. Some mugs even let you brew coffee as well. Since the tea infuser mugs normally have a built-in infuser, you can brew your cup of tea at work or at home right in the mug without any unnecessary hassle. The mugs can be made out of many types of materials such as glass, porcelain, or stainless steel. Usually, there are three pieces: the mug, mesh infuser basket, and the lid to keep your tea warm (the photo attached to this article doesn’t have a lid on the mug). Here is a very popular brand on Amazon of Tea Infuser Mugs . They are usually very inexpensive from $10-$30 and vary in how much water they can hold, but typically it is a cup or two. You can buy tea infuser mugs on most major online sites, along with at many tea stores. There are simple designs to very decorative designs. They make great gifts for the tea lover or for yourself. Some mugs are dishwasher and microwave safe, while others needs to be hand washed, particularly the ones with decorations on the outside. You will need a way to warm hot water whether with a tea kettle, hot water heater, or worst case scenario in the microwave. Most tea connoisseurs cringe at microwaved water being used for tea, but I will keep my comments to myself for now. Make sure to steep your tea at the proper temperature. The general directions for tea infuser mugs are to place the infuser basket in the mug, put your loose leaf tea in the basket, pour hot water to fill the mug, cover the lid, let the tea steep for your preferred amount of steeping time, remove the lid and infuser basket, and get ready for some good tasting tea. The directions will obviously vary depending on what you buy. You may be able to re-steep your tea leaves again. It is good to read reviews on your particular choice since some mugs can keep the tea warmer for longer periods of time and some infusers are better than others at keeping the leaves out of the water. Amazon.com always seems to have decent reviews on tea related products. Tea is such a great addition to a healthy lifestyle, and these mugs can help you meet your health goals. Since the mugs are pretty cheap, you could try out a few tea infuser mugs until you find the one best suited for you. Feel free to leave any additional recommendations below if you have purchased a tea infuser mug. While tea infuser mugs are just one way to brew loose leaf tea, they offer a simple convenient way to enjoy tea on the go or to brew less than a full pot. Check out the tea infuser mugs on Amazon . 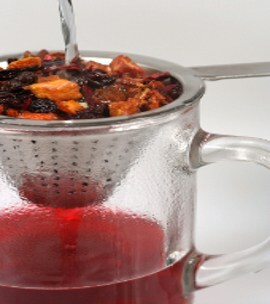 What is a loose leaf tea infuser? Tell me more. Should I Buy a Cast Iron Teapot to Brew Tea?